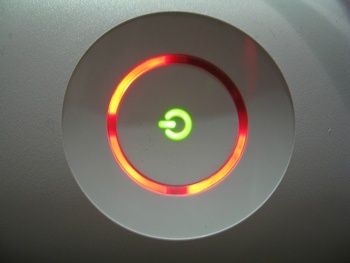 Microsoft guarantees that owners of the new Xbox 360 "slim" will never have to deal with the heartbreak of the infamous "Red Ring of Death" - It got rid of the Red Ring. Ever heard of the "Company Car Repair Kit?" It works like this: You're driving down the road in a company vehicle (or any car that's not your responsibility) when you hear a horrible noise emanating from under the hood. "My goodness, what is that horrible noise emanating from under the hood?" you ask yourself. "This calls for the Company Car Repair Kit!" And then you turn the radio up so loud that you can't hear the noise anymore. It's a tried-and-true approach that Microsoft appears to be taking with the newly-redesigned Xbox 360. Mindful of the psychic trauma and incredibly negative publicity cause by the notorious Red Ring of Death on the original 360, the company has moved to ensure that it won't happen again on the new 'Box by getting rid of the little red warning lights. "Now obviously, the box has a way to communicate to you if something has happened...but yes, three red lights are not part of our sequence of telling somebody something is wrong," Microsoft Game Studios Corporate Vice President Phil Spencer told IGN. "Obviously if you look at the success rate of the original 360s, we're very proud of both the way the company stepped up to support the customers that we had as well as the success rate we have with the box today. I think we've learned a lot. That learning has gone into the development of this [new] box." Microsoft did not comment on a rumor that the new Xbox 360 will "communicate" with its owners by setting their houses on fire.